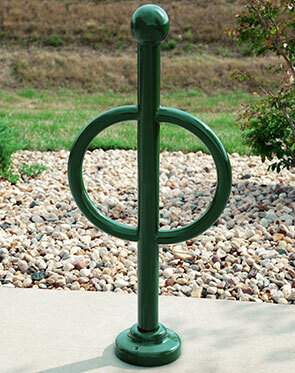 The standard ring & key bollard bike rack is the ideal dual-purpose bike rack. Made with 2-3/8" O.D. steel tubing, this bike rack can be used to limit access to bike-only trails & parking areas, while providing bicyclists a secure place to park their bike. This bike rack can be used as a security and/or traffic barrier to help protect pedestrian walkways. This 2-3/8" O.D. 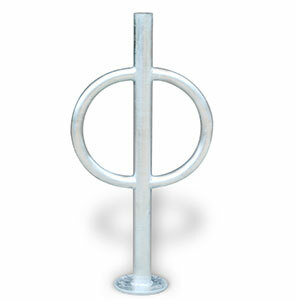 steel tubing bike rack is available in galvanized, powder-coated, and electro polished stainless steel. Choose in-ground or surface mount with base plate. An optional welded-on ball post cap to help secure your bike with a chain. The bollard bike rack features round 1 5/8" rod arms that can secure up to 2 bikes, and is easy to use regardless of the type of bike being parked. Drop In Anchors available for concrete installation. The 2 piece Grout Cover is the ideal aesthetic solution to conceal in-ground mount insertion point. Galvanized and Electro Polished Stainless Steel racks are paired with Spun Aluminum covers. 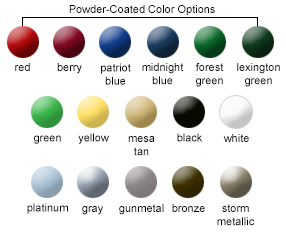 Powder-Coated finish racks are paired with color matched Powder-Coated Cast Aluminum covers. Two piece grout covers can be ordered from the Optional Accessories chart shown at the bottom. This grout cover will fit on both in-ground and surface mounts and can also be placed on existing installations.